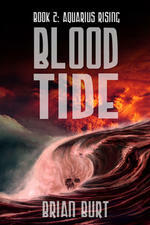 Blood Tide is the second book in the Aquarius Rising Series written by Brian Burt. I read the first in this series and this one takes the bloody destruction up to a new level. Where before it was the humans that wanted to wipe out the humanoid ocean dwelling race, the Aquarians, in this novel most of the battles rage under the ocean and let me just say they rage with fierce intensity. In the first book, an evil human leader wipes out colony after colony with its evil medusa nano-plague. Driven mad with grief, one of the survivors, named Megalops, vows revenge and sets himself to making his own plague, which will kill off all the human 'dirt swimmers' living on land. After joining with their living reef, he creates a method of controlling not only Aquarians and their human guardians, but even Smart Sharks and other dangerous creatures. So instead of hurting humans, he mostly set off a huge civil war that destroys his own race and their allies. Bio-warfare, mixes with high tech attacks and leaves the oceans running red with blood from every side. The book is brutal in its body count and this is all the more sad for the pure absence of any reason for it to be happening. Humans are not completely spared and several or their cities are destroyed to the last man, woman, and child. The half human/half Aquarian Ocypode is again the race's only real hope for survival, but there is oceans full of doubt whether he and his fellow Heretics can reverse this tide of evil as Megalops takes over colony after colony. Can the people rejected by their own save those who rejected them as well as the human on land that hate them as well? Possible downsides for this might include the pure blood bath the novel becomes. All the death and brother fighting brother seems so sad and then when the sharks come in and kill everything that moves it only makes things more brutal. This is not some happy mermaid tale, this is war and all the horrors that go along with it. Burt has created a complex and inventive world here. He has explored a new area that is often neglected by science fiction-life under the oceans. Very well thought out and real, despite its initial strangeness. Great series. I hope he sends me the next one.